We along with our kids get pretty spoiled here at Small Fry, so we’re always looking for ways to show our appreciation for the daddios who can seem overlooked in this space. We’re excited for Father’s Day this month and the perfect excuse to plan ways to spoil the wonderful fathers in our lives. Today we’ve teamed up with Artifact Uprising – a favorite source for beautiful prints and accessories from our Instagram feeds – to share an easy way to spoil your man this Father’s Day (order by June 14th to get it in time!) And don’t forget to enter below to win a $150 credit! All you need are a set of square prints from Artifact, printed right off your Instagram feed. Then photo-bomb (get it?) his office, car, bedroom, bathroom, wherever he will stumble first thing Sunday morning. We simply used wall tacky to adhere the prints right to the wall, writing “Love Dad” then he gets to take a chance to look at each print and take in just how much he’s loved. We love the idea of starting a secret Instagram feed to take pictures just of him and the family so it’s all new-to-him photos. If you’re looking for more gift ideas we love these beautiful hard cover books which make perfect additions to any coffee table or book shelf. 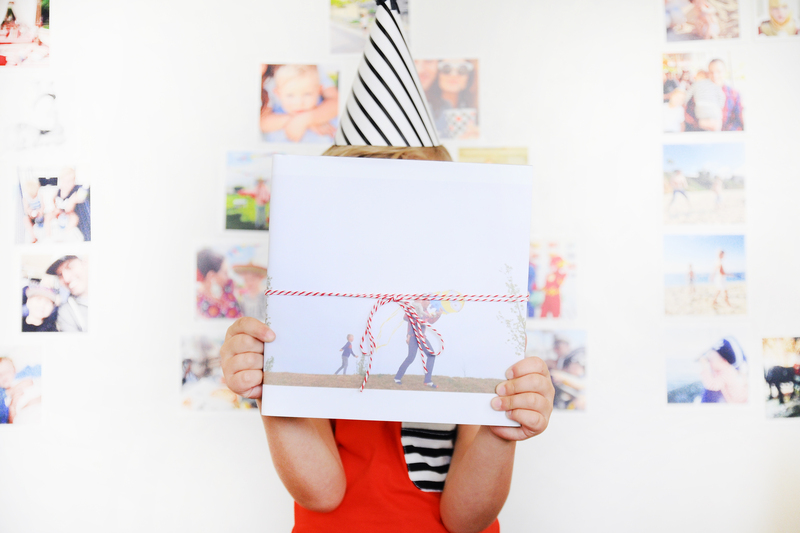 And of course Instagram friendly books that make printing our memories so easy and beautiful. We love the idea to print the occasional blank page to make room for wiring memories and special notes. Another added element that we know dad would love! Need more ideas for your prints? A display system for your wall and a bedroom headboard! What a great idea for Father’s Day. Love all these ideas!! I’m thinking about buying the hard bound book! I love this giveaway! That book is a great idea! Love Artifact Uprising. Their products are topnotch and make great gifts! I’ve really been itching to get some of my photos in print form. The kids love being able to hold them! I’ve been meaning to make a wedding photo book for 2.5 years. Now’s the time! Oh please help me with father’s day! Love this idea for father’s day! Thanks! I love my artifact uprising picture block and books! definitely have a project I could use this for!! LOVE artifact uprising! hope I win! love AU so much. great giveaway! Absolutely love all these ideas! I need more Artifact Uprising prints in my life! I would love this! It’s definitely time for me to get my pictures off disc and my phone this would be so perfect! I would love to win this to have some prints made for my Dad for Father’s Day. Lots of great ideas! Need to start working on a Father’s Day gift ASAP! This is perfect timing!